This article is about the plant. For the animal, see Sea anemone. For other uses, see Anemone (disambiguation). Anemone /əˈnɛməniː/ is a genus of about 200 species of flowering plants in the family Ranunculaceae, native to temperate zones. The genus is closely related to Pulsatilla ('Pasque flower') and Hepatica; some botanists even include both of these genera within Anemone. An illustration of an Anemone. Anemone are perennials that have basal leaves with long leaf-stems that can be upright or prostrate. Leaves are simple or compound with lobed, parted, or undivided leaf blades. The leaf margins are toothed or entire. Flowers with 4–27 sepals are produced singly, in cymes of 2–9 flowers, or in umbels, above a cluster of leaf- or sepal-like bracts. Sepals may be any color. The pistils have one ovule. The flowers have nectaries, but petals are missing in the majority of species. The fruits are ovoid to obovoid shaped achenes that are collected together in a tight cluster, ending variously lengthened stalks; though many species have sessile clusters terminating the stems. The achenes are beaked and some species have feathery hairs attached to them. Anemone are called "wind flowers." Anemone is derived from the Greek word anemoi, which in English means "winds" . Anemone is situated in the tribe, Anemoneae, subfamily Ranunculoideae, of the Ranunculaceae family. As considered in the broader sense (sensu lato) the genus subsumes a number of previously independent genera including Hepatica, Pulsatilla, Knowltonia, Barneoudia and Oreithales. Several of these were included as separate genera within Anemoneae by Wang et al., a tribe with six genera in total. Early molecular analyses divided the genus into two subgenera (Anemonidium and Anemone), with seven sections, and 12 informal subsections. Ziman and colleagues (2008) treated the genus Anemone as 5 subgenera, 23 sections, 4 subsections, 23 series and about 118 species. A further reclassification by Hoot and colleagues (2012) estimated 200 species. Hoot et al. found many of the previously defined subdivisions, based on morphological characteristics were polyphyletic or paraphyletic. In contrast two clearly defined monophyletic clades emerged corresponding to the above two subgenera. Anemonidium demonstrated four subclades, corresponding to sections. The larger subgenus Anemone showed a similar pattern. Within these sections a number of subsections and series were defined. Anemone species are sometimes targeted by cutworms, the larvae of noctuid moths such as Angle Shades and Heart and Dart. Of the late spring bulbs, Anemone blanda is one of the species grown in larger-scale commercial cultivation. It is most commonly available with a somewhat pale violet flower. A white-flowered form is the second-most common type. The least common of the commonly cultivated forms is a pale pink. The violet, and especially pink, forms often possess petals that fade to white near the flower center. The genus contains many other spring-flowering plants, of which A. hortensis and the hybrid A. fulgens have less divided leaves and splendid[peacock term] rosy-purple or scarlet flowers. They require similar treatment. Among the most well-known summer anemones is A. coronaria, often called the poppy anemone, a tuberous-rooted plant, with parsley-like divided leaves, and large showy[peacock term] poppy-like blossoms on stalks of from 15–20 cm high; the flowers are of various colours, but the principal are scarlet, crimson, blue, purple, and white. There are also double-flowered varieties, in which the stamens in the centre are replaced by a tuft of narrow petals. It is an old garden favourite[peacock term], and of the double forms there are named varieties. Hybrids of the de Caen and St. Brigid groups are the most prevalent on the market. Anemone hupehensis, and its white cultivar 'Honorine Joubert', the latter especially, are amongst the finest[peacock term] of autumn-flowering hardy perennials; they grow well in light soil[ambiguous], and reach 60–100 cm in height, blooming continually for several weeks. A group of dwarf species, represented by the native British A. nemorosa and A. apennina, are amongst the most beautiful[peacock term] of spring flowers for planting in woods and shady places. Anemones[ambiguous] grow best in a loamy soil, enriched with well-rotted manure, which should be dug in below the tubers[ambiguous]. These may be planted in October, and for succession in January, the autumn-planted ones being protected by a covering of leaves or short stable litter. They will flower in May and June, and when the leaves have ripened should be taken up into a dry room till planting time. They are easily raised[dubious – discuss] from the seed, and a bed of the single varieties is a valuable addition to a flower-garden, as it affords, in a warm situation, an abundance of handsome[peacock term] and often brilliant[peacock term] spring flowers, almost as early as the snowdrop or crocus. Anemone[ambiguous] thrives in partial shade, or in full sun provided they are shielded from the hottest sun in southern areas. A well-drained soil, enriched with compost, is ideal. If cut flowers are desired, it is best to harvest the flowers early in the morning while it is still cold outside while the bloom is still closed. To open your flowers place in room temperature water out of direct sun. Anemones[ambiguous] are a great[peacock term] cut flower and will give you around nine days of vase life when properly cared for. 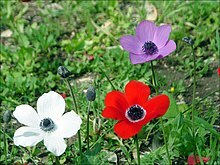 Anemone[ambiguous] blooms can be purchased from a florist between November and June depending upon availability. The anemone has several different meanings depending on the culture and context in which the flower is being used. Several of the Western meanings of anemone flowers pertain to the Greek Mythology of the origin of the anemone flower featuring Adonis and Aphrodite. The goddess Aphrodite kept the mortal man Adonis as a lover; when Adonis was gored by a wild boar, Aphrodite's tears at his death mixed with his blood and gave rise to the Anemone flower. In other versions, the boar was sent by other jealous Greek gods to murder Adonis. These origin stories reflect the Classical dual meanings of the arrival of spring breezes and the death of a loved one. In the Victorian language of flowers, the anemone represented a forsaken love of any kind, while European peasants carried them to ward off pests and disease as well as bad luck. In other cultures, the meanings can be very different. In Chinese and Egyptian cultures, the flower was considered a symbol of illness due to its coloring. It can be a symbol of bad luck in Eastern cultures, and because of its origins the Japanese Anemone tends to be associated with ill tidings. ^ Germplasm Resources Information Network (GRIN) (2007-05-10). "Genus: Anemone L." Taxonomy for Plants. USDA, ARS, National Genetic Resources Program, National Germplasm Resources Laboratory, Beltsville, Maryland. Retrieved 2008-05-15. ^ International Organization for Plant Information (IOPI). "Plant Name Search Results". International Plant Names Index. Retrieved 2008-04-18. ^ a b c Flora of North America. ^ a b Wang et al 2009. ^ a b Hoot et al 2012. ^ Hoot et al 1994. ^ Ziman et al 2011. ^ a b Flower meaning 2016. ^ a b c d One or more of the preceding sentences incorporates text from a publication now in the public domain: Chisholm, Hugh, ed. (1911). "Anemone" . Encyclopædia Britannica. 2 (11th ed.). Cambridge University Press. p. 3. ^ Silveira., Cyrino, Monica (2010). Aphrodite. Milton Park, Abingdon, Oxon: Routledge. ISBN 9780415775229. OCLC 277195883. ^ 1897-1973., Kerényi, Karl, (1951). The gods of the Greeks. London,: Thames, and Hudson. ISBN 0500270481. OCLC 387233. Porter, Noah, ed. (1913). "Anemone". Webster's Dictionary. Springfield, Massachusetts: C. & G. Merriam Co.
Natural Resources Conservation Service (NRCS). "PLANTS Profile, Anemone L." The PLANTS Database. United States Department of Agriculture. Retrieved 2008-05-16. Dutton, Bryan E.; Keener, Carl S.; Ford, Bruce A. (1997). "Anemone". In Flora of North America Editorial Committee. Flora of North America North of Mexico (FNA). 3. New York and Oxford. Retrieved 3 October 2016 – via eFloras.org, Missouri Botanical Garden, St. Louis, MO & Harvard University Herbaria, Cambridge, MA. Ehrendorfer, Friedrich; Ziman, Svetlana N.; König, Christiane; Keener, Carl. S.; Dutton, Bryan E.; Tsarenko, Olga N.; Bulakh, Elena V.; Boşcaiu, Monica; Médail, Frédéric; Kästner, Arndt (July 2009). "Taxonomic revision, phylogenetics and transcontinental distribution of Anemone section Anemone (Ranunculaceae)". Botanical Journal of the Linnean Society. 160 (3): 312–354. doi:10.1111/j.1095-8339.2009.00861.x. Hoot, Sara B.; Reznicek, Anton A.; Palmer, Jeffrey D. (January 1994). "Phylogenetic Relationships in Anemone (Ranunculaceae) Based on Morphology and Chloroplast DNA". Systematic Botany. 19 (1): 169. doi:10.2307/2419720. Hoot, Sara B.; Meyer, Kyle M.; Manning, John C. (1 March 2012). "Phylogeny and Reclassification of Anemone (Ranunculaceae), with an Emphasis on Austral Species". Systematic Botany. 37 (1): 139–152. doi:10.1600/036364412X616729. "Anemone L." Integrated Taxonomic Information System. Retrieved 15 May 2008. "The Plant List Version 1.1". Royal Botanic Gardens, Kew and Missouri Botanical Garden. 2013. Retrieved 7 July 2015. Wang, Wei; Lu, An-Ming; Ren, Yi; Endress, Mary E.; Chen, Zhi-Duan (January 2009). "Phylogeny and classification of Ranunculales: Evidence from four molecular loci and morphological data". Perspectives in Plant Ecology, Evolution and Systematics. 11 (2): 81–110. doi:10.1016/j.ppees.2009.01.001. Ziman, SN; Keener, CS; Kadota, Y; Tsarenko, OM (August 2006). "A revision of Anemone L. (Ranunculaceae) from the Southern Hemisphere". Journal of Japanese Botany. 81 (4): 193–224. Ziman, SN; Bulakh, EV; Kadota, Y; Keener, CS (June 2008). "Modern view on the taxonomy of the genus Anemone L. sensu stricto (Ranunculaceae)". Journal of Japanese Botany. 83 (3): 127–155. Ziman, Svetlana; Bulakh, Elena; Tsarenko, Olga (2011). "Anemone L. (Ranunculaceae): comparative morphology and taxonomy of the species from the Balkan flora" (PDF). Botanica Serbica. 35 (2): 87–97. "The Anemone Flower: Its Meanings & Symbolism". Flower Meaning. 2016. Retrieved 16 January 2016. Wikimedia Commons has media related to Anemone. This page was last edited on 23 March 2019, at 06:32 (UTC).